Far too often, people charged with illegally killing a wolf claim that they thought they were shooting a coyote. The man who shot the first wolf to reach the Grand Canyon, for example, made such a claim. The US Justice Department's McKittrick policy provides strong motivation to claim mistaken identity even if that was not the case. The policy prohibits prosecuting individuals who kill endangered wildlife unless attorneys can prove that the killers knew they were targeting a protected animal. Yet, there are times when a person honestly thinks he is shooting at a coyote but is really aiming at a wolf. Is there a way to reduce the number of wolves killed by mistake? Of the 711 radio-collared grey wolves that died in the western US between 1982 and 2004, 12 percent were killed illegally. Of all the red wolves that have died to date, 25 percent of them fell to illegal shooting. For Mexican wolves, illegal killing accounts for about 55 percent of all deaths from 1998 to 2013. These are just the deaths that researchers know about. The count does not include what could be a large number of wolves killed secretly by those who believe in "shoot, shovel, and shut up." 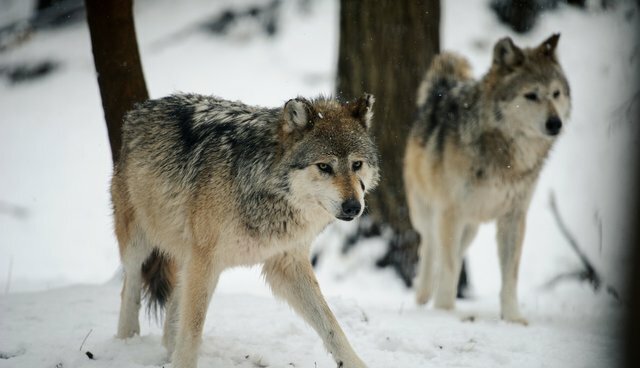 Whatever the total number, the authors state that illegal killing of wolves represents a substantial failure in current management, since it has been argued that to meet the objective of the Endangered Species Act, wolves need to recolonize significant portions of their former range. And - after decades of trying - grey wolves still occupy only about 15 percent of their historic range in the lower 48, "while Mexican wolves and red wolves are among the rarest terrestrial mammals in the world." The authors believe that new management strategies are required to help wolf populations recover. They suggest that one way to reduce illegal killing is "the banning of coyote hunting at least during the ungulate hunting season to prevent cases of mistaken identity, especially where wolves are at low densities, or recolonizing new areas." They report that this approach worked in the 1980s when Wisconsin implemented a coyote hunting ban during the deer hunting season to eliminate wolf killing due to mistaken identity. After that ban, wolves had unprecedented population growth. Banning coyote killing won't be easy. Some people view coyotes as vermin to be destroyed without remorse. Others feel strongly that coyote hunting and derbies help reduce livestock losses. But banning coyote killing makes sense. The authors point to research that shows "coyote populations are far too resilient to be affected by most periodic control eradication programs, let alone from derbies or recreational hunting." Though coyotes are resilient, the same can't be said of wolves: humans killing wolves "is a critical risk factor that requires management, especially when individuals move into new territories unoccupied by other wolves." In other words, dispersing wolves need all the protection they can get. Banning coyote hunting and senseless derbies can benefit coyotes and reduce the number of wolves killed by mistake. I would add that eliminating the McKittrick policy would help too. Rick Lamplugh is the author of the Amazon bestseller "In the Temple of Wolves: A Winter's Immersion in Wild Yellowstone." Available as eBook or paperback. Or as a signed copy from the author.